By at least one measure, these economies rank best in the world, according to the International Monetary Fund's estimates. Luxembourg is a tiny country -- and even has to import labor. The tiny European nation of Luxembourg is mighty in at least one respect: It has the highest gross domestic product per capita in the world. At $55.9 billion, Luxembourg's economy is actually rather small -- but it also has a very small population, resulting in a GDP of $106,958 per person -- a figure rivaled only by that of Qatar. 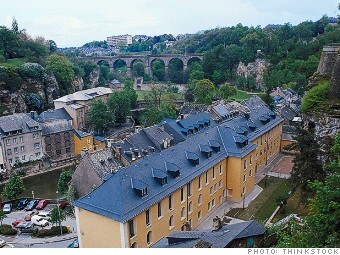 Luxembourg enjoys a gold-plated AAA credit rating, historically low unemployment and low inflation. The financial and industrial sectors make up much of the country's economy, and its citizens have one of the highest standards of living in the world. Yet the country does have a few quirks. Nearly 60% of its workforce is made up of foreigners, and its permissive tax laws have drawn scrutiny from the international community.